This article starts with the premise that you have up to five thousand pounds to spend on a new gun. Great Aunt Agatha may have remembered you, a bonus could have come through, or, perhaps you just want to spoil yourself. How much gun can you get for this sort of money? The choice is vast. So wide, in fact, that some parameters must be set. It is not the intention here to consider budget guns, though,en passent, we might note that some very good over and unders are available at just over £1,000 mark today, not least the new Beretta 686 Universal and Silver Pigeon I (both with an RRP around £1,400). The first has fixed-chokes, the second, multis. The Miroku MK 60 and 70 (RRP £1,300 and £1,360 respectively with similar choke options) also offer excellent value and classic design, as does the Browning 525 Hunter (RRP £1.460). I also like the Guerini Woodcocks and Tempio (RRP £1,658) – especially recommend in 20 bore 30” form – beautiful handling guns at reasonable cost. The emphasis here is on more expensive guns. At the top end of our 5K budget, a discounted Beretta EELL (RRP £5,700) might just squeeze in. I have always thought these especially good game guns. Not because of the added embellishment of their side plates, but, because, in my view, they handle a little better than the standard models with more weight between the hands and subtly superior stock shapes. I have a 30” 28 bore which has given me great service, and, I have also had 20 and 12 bore versions. You would have to go a long way to find a better game gun for hard use than a 30” 20 bore EELL. They’re solidly made, shoot well, and hold their value. There’s also a 10 year guarantee for all Berettas bought before the end of the year. Other Berettas that might be considered include the Silver Pigeon III (£2,300 whether in .410, 28, 20 or 12 bore). It is a sound gun without excessive embellishment. Berettas on the new SV10 action platform might also be considered. The asymmetric styling of the new action is distinct, and the engineering is impeccable. The SV10 guns seem to handle and shoot a little better, on average, than the indestructible 68 series guns (perhaps because of their new barrel profiles). The SV10 Perennia 1 is available in 12 bore only at an RRP £1,825 with a conventional stock or £2,025 with a Kick-Off hydraulic recoil reducer. My preference for game shooting would be the simple gun. The Perennia 3 is available in 12 or 20bore for RRP £2,530 (£2,735 with Kick-Off). There is a slight difference in action finish between Perennia 1 and 3. The 1 does not offer a detachable trigger mechanism or ‘Q system’ detachable stock. Looking at the extensive Browning-Miroku range, there are many options as well. There is a Grade V bold scroll engraved Miroku MK 60 in 28 and 30” form at £2,489. The Grade V, multi-choked, MK70 is £2,612. And, one of my favourite guns, the MK 38 Grade V 32 (a 30” version is also on offer) is one of the best buys available anywhere at £2,554. If you are in the market for a high pheasant gun that can do double duty on clays look no further. When you consider that these guns are impeccably hand finished, beautifully engraved, and regulated the old-fashioned way at the plates, they appear a particularly good buy. Browning also offer the side-plated, square-bar, Heritage model. This is available with 28 and 30” ‘Invector’ choked barrels just under £5,000 RRP. It has been extremely popular as a hybrid game and clay gun because of its looks and no compromise build quality. It is a bit chunky to my eye, though, and feels a little heavy too. The same comments cannot, however, be levelled against the new rounded-bar 20 bore. It has not been priced officially yet, but will come in just under our magic figure and is offered with 28 or 30” tubes (the latter would usually be my call in a 20 bore). Browning also have the Hunter Prestige without sideplates. It is a high grade modified Superposed style gun with deep scroll and game scene engraving, tear drops on the stock and a silver oval. All Browning guns come with a ten year general warranty, and, uniquely, a three year warranty on their wood. Guerini offer some well priced and well finished over and under guns. They seem especially competitively priced for their levels of finish. For £2,045, you can get a side-plated, Magnus game gun scene graved model with a coin finished action, excellent semi pistol grip , and shnabel forend. It is available in 12, 20, and 28 bore, and, .410 with barrels from 28-32”. My preference though is for the Essex and Maxum models (I shoot the latter myself in 32” 20 bore form and am extremely pleased with it). The Essex comes is at £2,845, and has fine rose and scroll engraving of Purdey style on a coin finished action. There is a new English style Prince of Wales grip and a rounded forend (my preference over the Schnabel). The Maxum, RRP £2,965, has a silver action with bold scroll engraving. It also has a rounded forend. This gun would be another one of my best buys – great looking and fantastic to shoot in either 30 or 32” form. For an RRP of £3,775 you can have the extra finish Apex Game gun, another side-plated gun with heavy scroll and an almost celtic style oval embellishment to the rear of the side-plates. This gun has an extended trigger guard and which goes all the way back to a steel grip gap on its not-too-full pistol grip. Guerni has introduced a new range of round action guns as well. The least expensive of these is the Elipse Limited (RRP £2,775) which has a colour case hardened action body and border engraving. It is available in 20 and 28 bore at the moment (with a .410 and 12 coming next year). Barrel options are 28 and 30” – though I would only consider 30” myself as it works extremely well with this gun in 28 or 20 bore. The stylish Elipse EVO, RRP £3,775, gets my vote again for outstanding looks, value and performance. It would be hard to imagine a prettier looking gun, and its handling qualities and stock design (combining an open radius semi-pistol grip with a rounded forend) are excellent too. It is on offer with 28, 30 and 32” barrels in 28 and 20 bore (and like the Elipse Limited will be available soon as a .410 and 12 bore as well). The sighting rib is a solid, tapered, design. ASI are offering a number of guns which fit our bill. On the side by side front, the square bar, AyA No.2 comes in at £4,900. It is one of the country’s most popular driven game guns, predominantly bench made, and well proven. The AyA best boxlock, a gun for which ASI Managing Director, Edward King, has an especially soft spot also meets our price and quality requirements at £4,490 (12 bore) and £4,716 in 16, 20, 28 and .410. ASI are also involved in a new project with the B.Rizzini brand. Batista Rizzini has been one of the movers and shakers of the Italian gun industry in recent years and now has a very substantial production facility. Rizzini guns are far better than they once were and the round action – first filed up by Laura Bosis on the suggestion of Paul Roberts (see below) – is especially appealing. 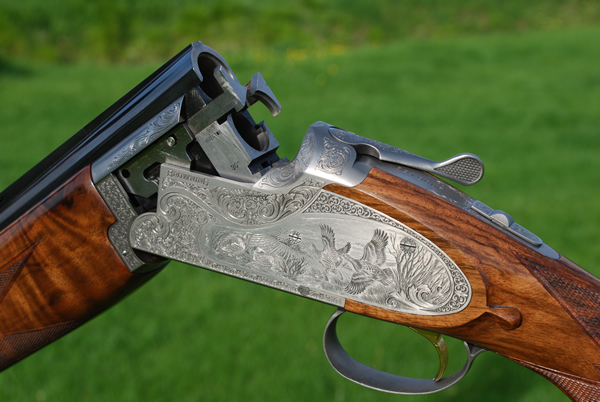 The RB (Round Body) Classic is available as a 12, 16 or 20 bore for £3,318, and as a 28 bore for £3,772. Again, I have found the 30” version works especially well in 28 and 20 bore – pointable but controllable too. The stock shapes are first class. If you don’t want to spend quite as much there is the square bar Aurum at £2,192 in 12, 16 and 20 and £2,620 in 28. Paul Roberts of J.Roberts in Vauxhall also offers some custom Rizzinis to his own well-considered specification. He has been bringing Rizzini guns into this country for many years and understands the guns and needs of British game shooters. He does a nice, but plain Atemis, model which is £2,400 and boasts a plain colour case hardened action with sideplates. I think it is one of the smartest guns Rizzini offer – simple elegance. Paul also has the London model (RRP. £4,000) and London Model Deluxe (RRP. £4,950). The main difference between them is the extent of engraving – the former has fairly light coverage, the latter profuse deep acanthus scroll. All the guns are available with fixed or multi-chokes, solid or vented ribs, and with any stock configuration required – straight-hand, semi, or full pistol grip. Arrietta named side by sides are now brought into the UK exclusively by GMK (who have handled the make for many years along with Beretta and so many others). The Crown round action sidelock model, which is not unlike a AyA no. 2, is £3,900 with double triggers and scroll engraving in 12 bore, 28 or 30”, ¼ and 1/2 fixed chokes. The 20 bore costs £4,360. There is a cheaper Viscount with a square bar and some scroll engraving is available in 28” only at £2,455. E.J. Churchill and William Powell are also getting Arrieta to make guns for them, however. The Churchill Continental Crown is £3,900, made to measure at no extra cost, in any gauge with any normal barrel length. The Powell Monarch, a bouquet and scroll engraved sidelock non-detachable, falls within our remit too at £4,100 in 12 bore (10% more for 16,20, 28 and 410). The guns I have handled were well finished and shot well. Blaser’s F3 is an impressive, modernistic, over and under of unusual design with an inline hammer action perfected by Russian designer Sergi Popikov. It’s a severely elegant design and very low in profile, the basic model is £3,882 with Grade 2 upgraded wood and any a choice of ribs and stocks. The ‘Professional Game’ is £4,900 and comes in a smart ABS case, boast ‘Grade V’ wood, and has a clever system that allows you to adjust the balance of the gun to your needs. Viking Arms brings in both Fabarm and Merkel ranges. Fabarm offer some strongly built side by sides with an unusual four lump action and a reliable single trigger mechanism. The deluxe, side-plated, Classis Grade 4 has an RRP of £4,286 (though Fabarm side by sides start from £2,370 and are notable because they handle rather like over and unders). The Merkel 40E (RRP £3,459) is a stongly built side by side with a Greener style top extension and double triggers (there is a single option). Merkel also offer the 2000C over and under at £4,800 with single or double triggers. Finally, I might mention that Fausti make some very nice small-bore boxlock side by sides and round and square bare over and unders priced under £5,000. But these will be special order items from the Sportsman Gun Centre. Buying new is not your only option with £5,000 to spend, of course. You can buy second-hand, possibly, at auction – and, if you are careful, get some great deals. On the retail front, guns like the EELL Berettas, Belgian made Browning B25s, MX8 Perazzis and KM4 Kemens, can offer both quality and value. You can buy an excellent gun, which has done most of its depreciation, for far, far, less than the new price. Good and best quality boxlock side-by-sides are a particular bargain. The best deals are on weapons which have less than trendy specifications. For example, guns with shorter barrels.